He later mentioned you’ll see a 3-foot wave machine around the base of the big pirate ship on the east side of the yard. Another difference from last year – instead of various vignettes over the course of a half-hour, this is one 20-minute show, with a significant “reset” time, so they’ll likely do it several times between 6 and 9 on Friday and Saturday nights. Here’s a map to 36th/Hanford; you can read lots more about Skeleton Theatre at the official website. 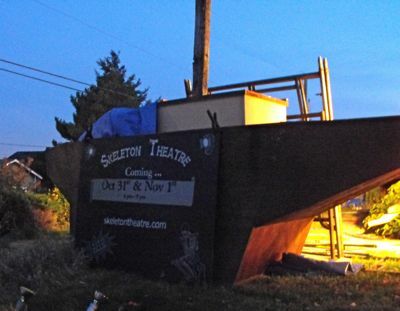 2 Replies to "West Seattle Halloween: "Skeleton Theatre" preview"
kudos to the skeleton theatre crew! like j.p. patches or the wheedle on the needle, i suspect the theatre will be remembered by seattle’s children long into their adulthood . . .